MPR: Minimum wage hike and smoking ban: a double whammy for bars and restaurants? Minimum wage hike and smoking ban: a double whammy for bars and restaurants? If you haven't been out to a restaurant or bar in the Twin Cities lately, you might notice a few things are different. The ashtrays may be gone, the prices on the menu might be a bit higher, and fewer customers may belly up to the bar for "last call." The changes are the result of recent laws, some of which started Aug. 1, that deeply affect the service industry. Proprietors in St. Paul have mixed reactions to those laws. St. Paul, Minn. — The recent slate of laws started back earlier this year, when smoking bans forced many Twin Cities area bars and restaurants to go smoke-free. Ramsey County's smoking ban affected restaurants primarily. Some proprietors say that's led to a drop in patronage. Then on Aug. 1, a new law raising the minimum wage by $1, to $6.15 an hour, took effect for most businesses. Labor experts say the law will affect the service industry more than most others, because more than one-third of Minnesota employees earning minimum wage work in the service sector. And finally, another law starting Aug. 1 lowers the blood alcohol threshold for drunk driving, ostensibly curtailing the number of people who order "one more for the road" before leaving their favorite drinking hole. Tom Day, vice president of government affairs at the Minnesota Restaurant Association, says all these new laws spell doom. "The restaurant industry is at a dangerous crossroads," Day says. "There are a lot of business owners throwing up their hands saying, 'Why should we operate in Minnesota anymore?'" The restaurant industry might be at a crossroads, but not every business is navigating that crossroads in quite the same way. W.A. Frost and Co. is an upscale bar and restaurant in St. Paul, with lots of turn-of-the-century charm. 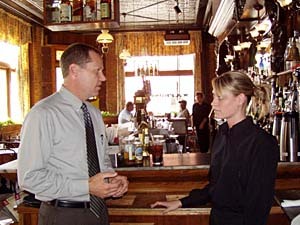 According to Robert Crew, the general manager, the recent smoking ban has actually been a boon for business. "A number of our guests in the past would have loved to go into the bar, but it was just too smoky for them," says Crew. "So now it's actually busier, because the smokers still love coming here and will come here regardless." Crew isn't concerned about the threshold for drunk driving getting lowered; he doubts it will hurt business. But he is worried about the minimum wage increase. It means raising the pay scale of about 42 employees. "Menu items generally have a tendency to go up in order to recoup these costs. We try to find cuts in other places. But it ends up being kind of a collective thing that the community ends up feeling, that diners feel," Crew says. On the east side of St. Paul, in a more working class area, Jim Theodorakakos tells the same story. But it doesn't trouble him. His restaurant, the Coffee Cup, serves diner-style food. "If wages go up, you just change the price -- a nickel here and dime there," Theodorakakos says. "It's no problem. The smoking is the problem." Theodorakakos says the smoking ban cost him 30 percent of his business. But he won't be put out by paying his staff a higher wage. It'll cost him less than it would've before the smoking ban. He says the loss of business caused him to cut his staff in half. Menu items generally have a tendency to go up in order to recoup these costs. "We had to fire six or seven waitresses and two cooks," Theodorakakos says. "We used to be open till 9 o'clock at night. We close at 3 now." Those complaints about the smoking ban are borne out by figures compiled by the Minnesota Department of Employment and Economic Development. Labor expert Steve Hine says since the smoking ban went into effect at the end of March, overall job growth at food service and drinking places has dropped off about 1.5 percentage points. And unemployment claims filed by service industry workers have increased during that same period. "Claims in the food service sector are up 10 to 15 percent, and that comes at a time when claims overall have been on the decrease," Hine says. While the smoking ban may have hurt businesses, Hine says the minimum wage increase could actually strengthen overall employment figures. He says his agency studied various states that raised their minimum wage rates over the past decade. "We found in a majority of the cases, the unemployment rate fell subsequent to an increase in the minimum wage rate," Hine says. So even if the minimum wage increase causes businesses some strife in the short term, it may help the overall economy in the long run. Individual bar and restaurant owners may see different effects from the combination of the smoking ban, new blood alcohol limits, and the minimum wage increase. But in the end, state labor market data suggest that the minimum wage hike might not aggravate the effects of the smoking ban.